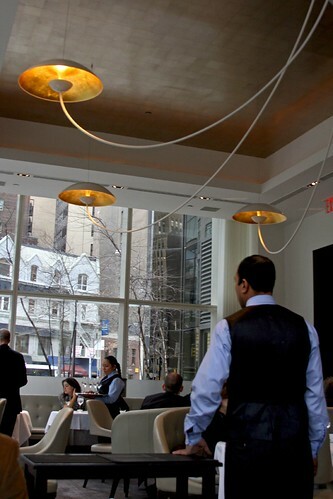 The most unimaginable thing happened to me for on Thursday: eating lunch with two executive chefs at Jean Georges. Just to give you the gist on how this event to ever occur, Marc Collins of Circa 1886 in Charleston, SC, emailed me for a bunch of recommendations to eat out around Manhattan since he’s cooking at the James Beard Foundation for the Tastes of Charleston event. We emailed each other for a good number of times and in the end, he asked me to join him for lunch at JG with his best friend, Kyle Ketchum of the Spiced Pear in Newport, RI. When I got this invitation I was thinking, “Huh?! Me, an insignificant food blogger having lunch with executive chefs? Have they gone mad? !” No, I don’t think they’re crazy; only me. (I should clarify this now that I paid my own lunch). We’ve met outside at Jean Georges and went in to check our stuff. We waited several minutes at the desk for our table to be ready. 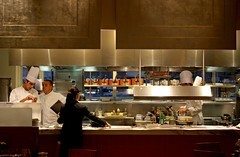 During our wait, we chatted about their dinner at Momofuku Ssäm and a briefly about myself. 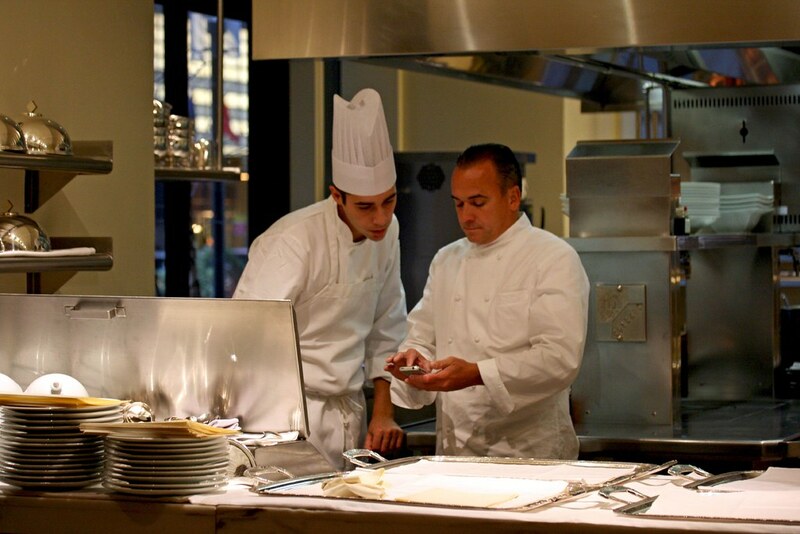 When our table was ready and walked through Nougatine, the casual portion of JG, we all saw Jean Georges himself in the kitchen. This particular moment was poignant since anyone who have ever heard of Jean Georges, he has sixteen restaurants internationally. Obviously, it’s a rare sight to see him in the kitchen. When all three of us got seated, Marc and Kyle started to debate whether or not they should ask for a tour of the kitchen. But the subject got dropped once our waitress started to ask what we like to order. 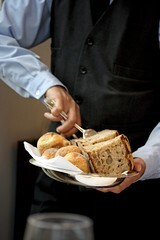 After we ordered, we’re served with the usual bread and butter. The sourdough bread was notably sour. 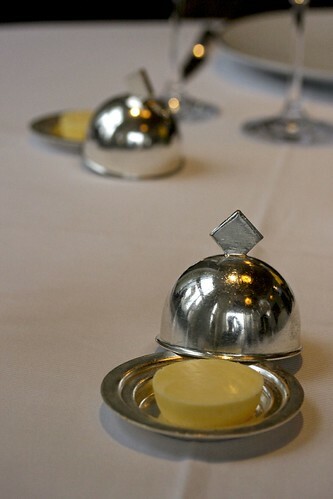 What Kyle had noted was that the butter was slightly tart as well. 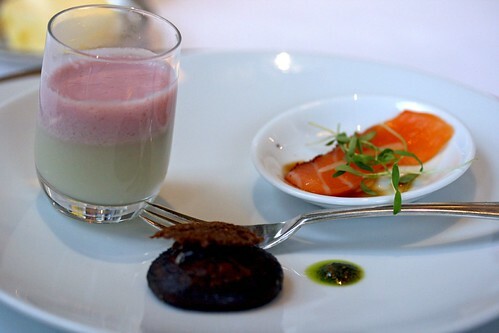 Then our amuse bouche has arrived. The shot glass is filled with artichoke soup with cranberry foam. This soup was very good: the mild artichoke flavor, warm, smooth and creamy with a touch of tart and lightness from the cranberries. Somehow from the amuse bouches I’ve eaten here, their soup have been pretty spectacular. 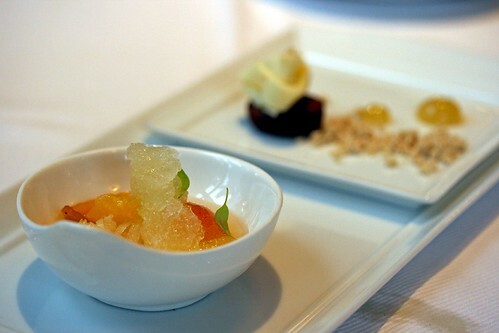 The shiitake mushroom was meaty, potent, and earthy contrasted with the acidic bite of the gelée. 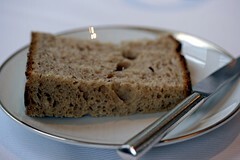 The crunchiness is from the thin toasted rye bread which gives it some substance to the chew. It’s wonderful. 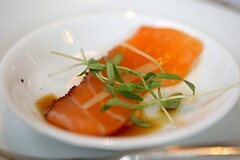 The fresh, silky salmon belly was flavored with a splash of chili vinaigrette, giving it a tart, spicy kick. The most notable part was eating it with the herb (I don’t know its name) that topped this salmon – it was bracing with a sharp herbal flavor. It’s good but not as great as the other amuses. 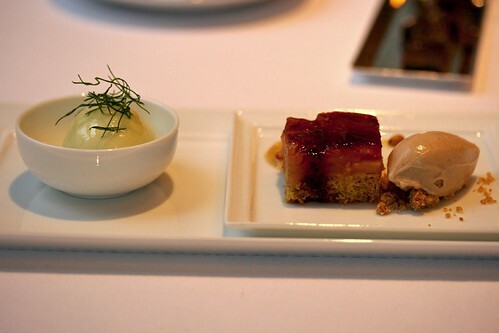 The foie gras brûlée was Kyle’s first course. Since we all ordered our own foie, I didn’t taste his only take a photo of it. I’ll explain this dish when you get to mine. The sea scallops were Marc’s. The sea scallop was seared perfectly. 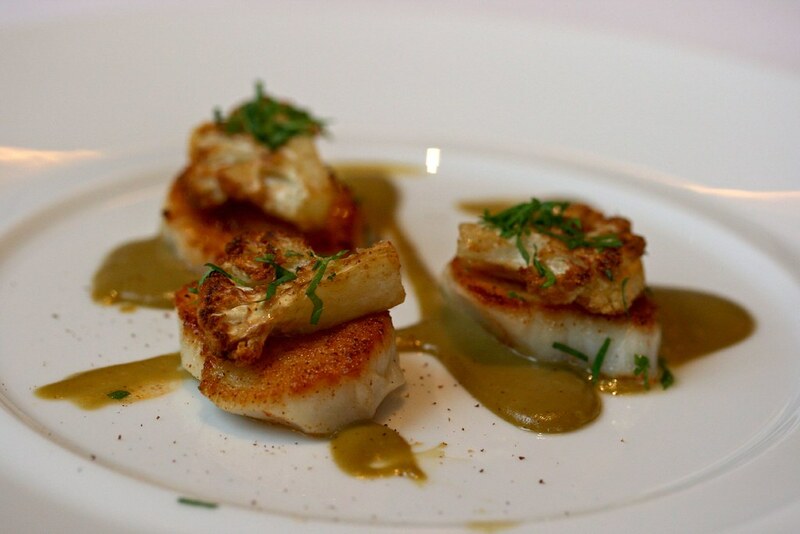 A thin, slightly crisp crust meets the sweet, meaty scallop with an extra punch of sweetness and crunch with the cauliflower. 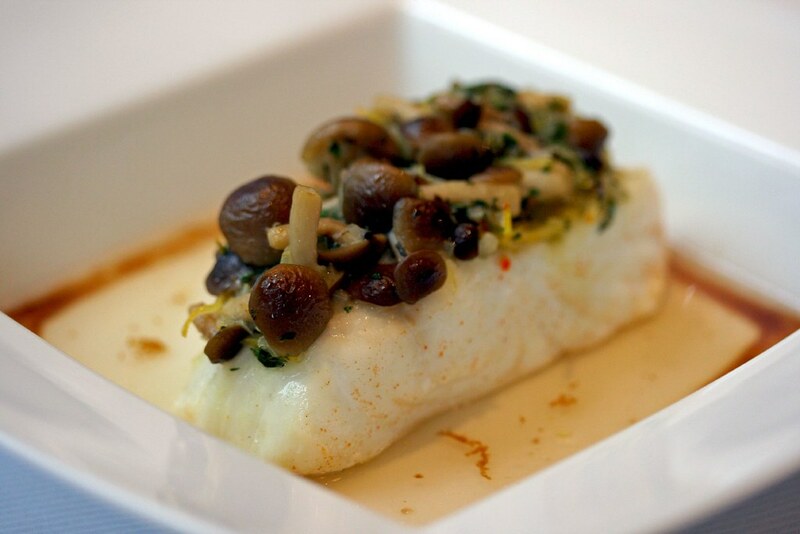 The capers was quite potent on the sauce, as both chefs have noted. My tuna dish attracted a bit of attention from the chefs was due to its presentation: thick strands of tuna, twirled and piled like it was spaghetti. It just boggled their minds how the kitchen actually pull it off. In terms of taste, this was a winner. 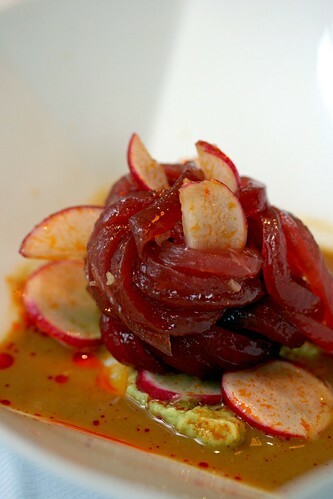 The tuna was fresh and meaty, flavored with a potent ginger marinade. The avocado almost made me think I was eating wasabi since it absorbed the marinade and the chili-flecked radishes brought crunchiness to the party. We all liked this dish the most in this round. 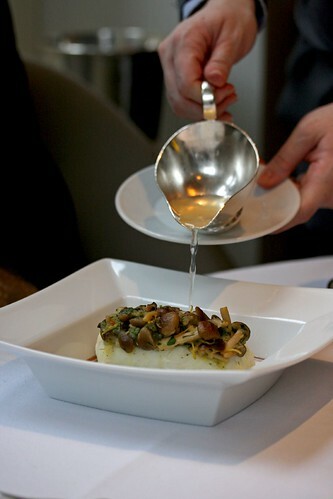 Kyle’s halibut steamed with honshimeji mushrooms and lemon grass consommé was very bright and citrusy. His main reason to order this dish was to try the consommé, which I thought was bland compared to the fish. 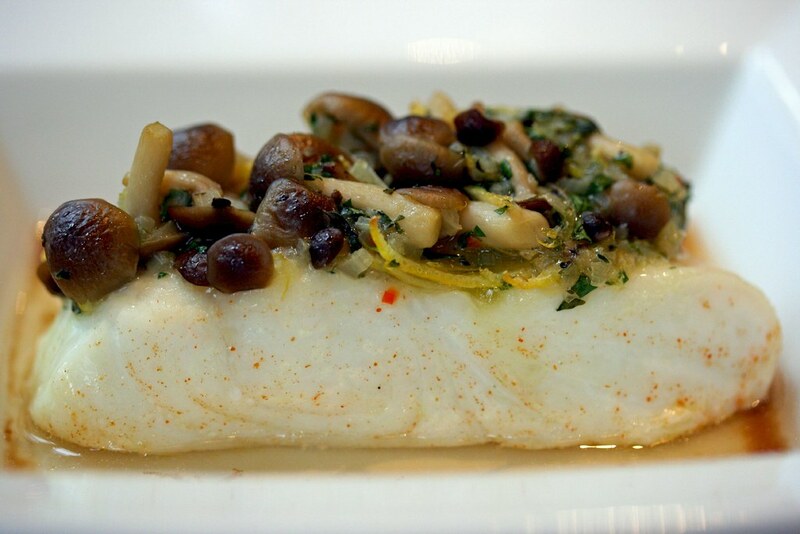 The halibut was meaty, moist, and intensely bright from all that lemon and other citrus fruits’ zest embedded with the delicately earthy mushrooms. Marc’s second course was the foie gras. Still looks as great as Kyle’s…but I’m still not going to talk about it until we get to mine. Finally, our last savory course. 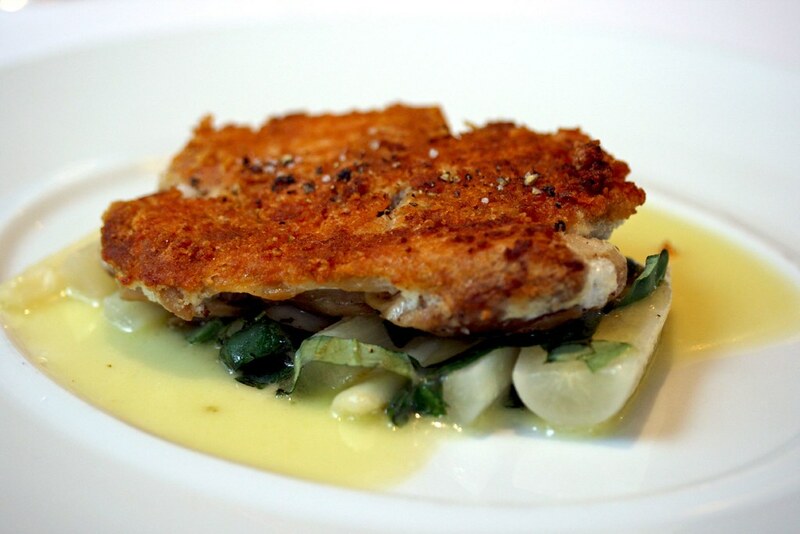 Marc’s parmesan crusted confit leg of chicken was tender and moist with a crisp top. 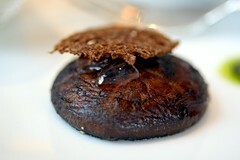 The salsify was sweet (in a savory, vegetal way), tart and tender. It’s a good chicken dish but I’m not reaching some kind of epiphany. 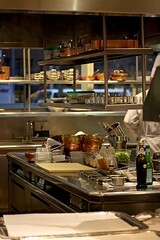 Since Marc and Kyle are chefs, they’ve actually tried to figure out how did the kitchen pull out a dish like this (e.g. discussing cooking techniques, etc.). Interesting to listen. From what I can remember, they said that confitting the chicken saved it from drying it out when it’s pressed flat and getting that crunchy exterior. 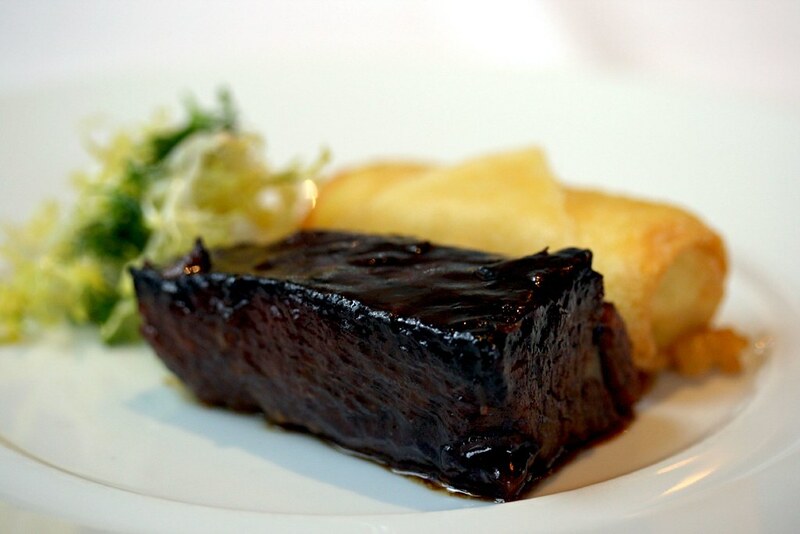 Kyle’s short rib was hearty, a bit sweet, with a melt-in-your-mouth texture, and generously portioned. The crunchy grits was the item that looked similar to an egg roll. What he said that it’s too sweet to be savory that he would daresay that he’s eating dessert. This dish tided him over to a food coma. Strangely, what Marc told me was when they ate at Per Se the other night (and ate about fourteen courses), Marc was dying halfway their dinner, while Kyle actually was doing fine and kept on going. But Kyle did admitted to me later that red meat makes him sleepy. 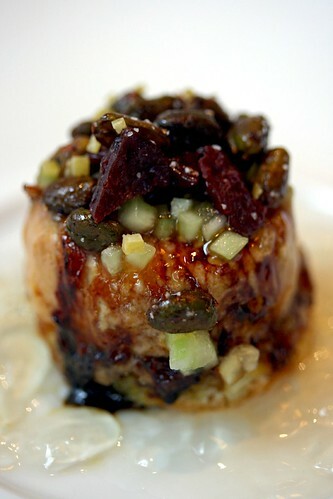 The foie gras brûlée topped with dried sour cherries, candied pistachios and sitting on a bed of white port gelée. I would say that this would be almost perfection on a plate. Almost. The smooth, luscious foie gras meets the sweet, crunchy roasted pistachios. 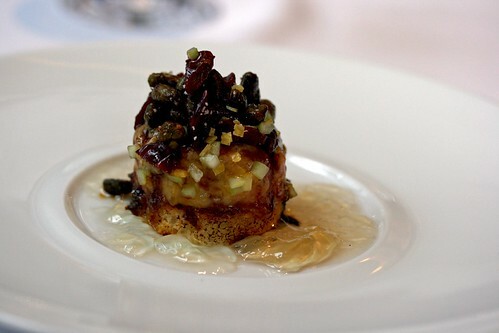 The tart, slightly chewy, dried cherries with a touch of toasted bread that’s under the foie. 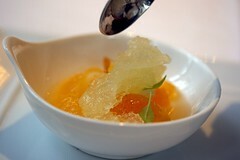 All of that is hit with a punch of acidity from the gelée to lighten the dense flavor of the foie. If this was served warm (as both chefs have mentioned) it would take this dish to another level – to the most divine foie dish. We can almost taste it. Crashing down from our food elations, we sat out a bit and talked about our lunch a bit before the waiter gave us the dessert menu. Kyle was still in his food coma, yawning every now and then, not really wanting to eat another bite of food. 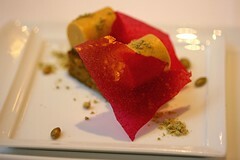 But he was intrigued by the flavors and the elements in several desserts. For now, he didn’t order any dessert. Marc and I have chosen our own desserts. 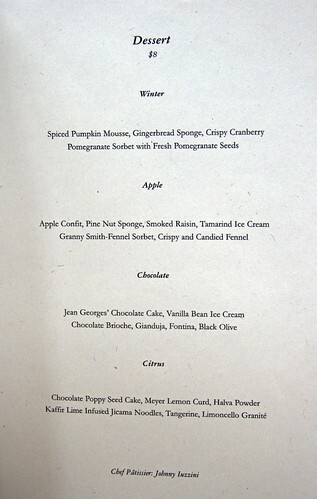 Marc’s dessert, “Winter,” was good. The gingerbread was nicely spiced, not too sweet and the pumpkin mousse was light with some substance from not being too airy and its flavors. I haven’t tried the crisp but generally, I wasn’t too amazed with this dessert. 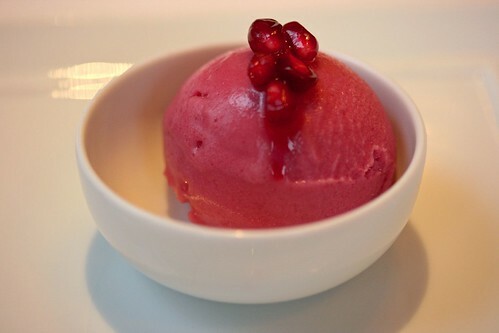 The pomegranate sorbet was suprisingly subtle. I was expecting an intense tart pomegranate flavor but it’s very subdued. 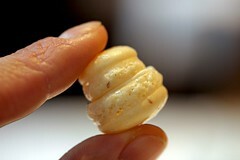 But it was very smooth, almost creamy like an ice cream. I had the “Citrus” dessert. What attracted me to this dessert was the use of jicama. The jicama noodles actually reminded me of cellophane noodles texturally for being slightly chewy and color-wise (or lack of). It’s intensely flavored with the citrusy flavors of the kaffir lime, tangerine and limoncello gratinee. The chocolate poppy seed cake was a bit dry since it’s so tiny and the Meyer lemon curd that topped that cake was a bit too stiff for my liking. 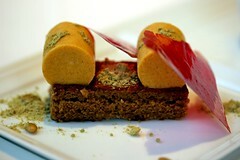 The halva powder was an interesting crunchy component. After seeing our desserts, Kyle changed his mind and ordered the “Apple” dessert. He said that he’s ordering it for the sake of seeing it. His dessert was a bit unbalanced. 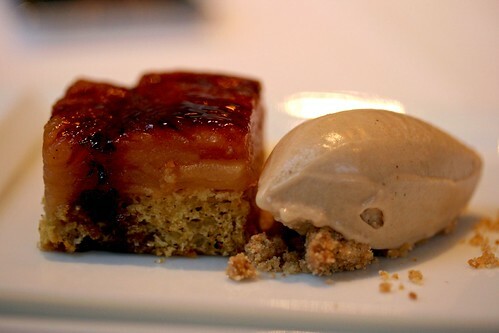 The apple confit, pine nut sponge, and smoked raisin was way too smoky – most prominently from the brûléed top, rendering the apples to taste bland. The tamarind ice cream was creamy and richly spiced. I haven’t tasted the Granny-Smith fennel sorbet but from their reactions, it seemed to be a bit mixed. 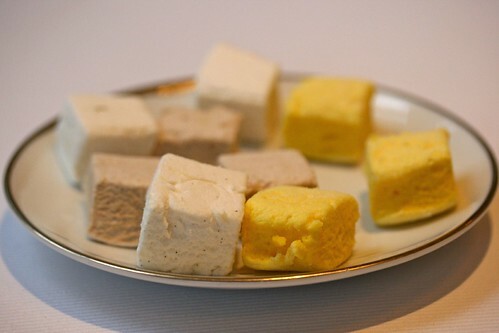 Then the usual way for Jean Georges to end the meal in style, the petit fours with the usual ceremonial marshmallow cutting, the plate of microscopic macarons and the tray of chocolates. The marshmallows are soft but I don’t really care for them that much. Of the three flavors (cinnamon, Meyer lemon and vanilla) offered, cinnamon was the best. 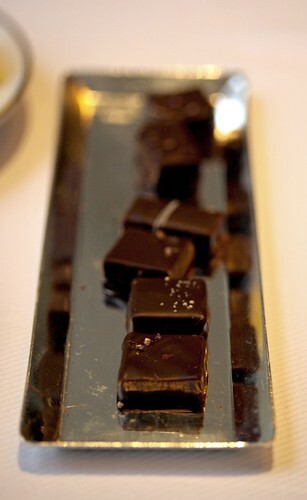 The chocolates were very delicious – dark chocolate, around 65% cocoa content filled with various fillings. From what I can remembered that was served was chamomile, cappuccino, Bergamot, chai, and others. I was too stuffed to go beyond two bonbons. 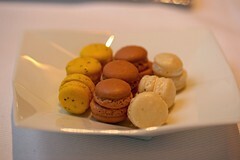 And the macarons (poppy seed, vanilla, and chocolate), as much as they are adorable, are still dry and chewy. It was a very good lunch (and long since it was a two-hour lunch) nevertheless. Great service, delicious food (some better than others), and the company was great as well. Once we got our coats and bags from the coat check, we bid farewell to each other as Kyle has to go back to Rhode Island and Marc’s leaving the city several hours later. It’s been one heck of an afternoon that I’ll never regret. If you want to see the slideshow of the entire lunch, click here. the other person in the pictures with jean georges is his son! alright, that was my initial reaction to the title of this post. 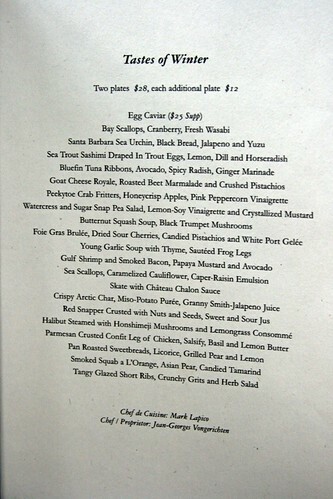 Can I tell you how much I appreciate Jean George Vonrichten for elevating chinese cuisine to haute cusine in America? Americans have so little appreciation for China’s culinary history (arguably one of the greatest in the world, althoug I’m obviously biased), and think chinese food is about *beef and brocolli* or god forbi crab rangoon. While J. G. V isn’t exactly all about the great traditiona dishes of China, at least he can get people interested enough to look beyond their local takeout joint. I kind of see that happening already, just not enough yet for me. Aya: Hahaha! That’s the same reaction when I got the invite. Commenting on your comment in a concise fashion, yes, I do give him some credit to focus on Asian cuisine (Thai and Chinese). I am so jealous!! You are so lucky! I wouldn’t have been able to talk to JG either. I get totally chef star struck. Great pictures! That looks like an exquisit meal! And that is super cool that you got to hang out with those chefs and gage their reactions to Jean Geroges food. What an exciting experience Tina. I am so happy for you. 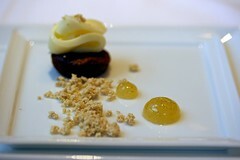 or jealous, or happy, or jealous…I have only been to JG once and I had the foie dish you had. I remember liking it but the richness made me sick after a few bites so I had to pass the rest to my eager boyfriend. 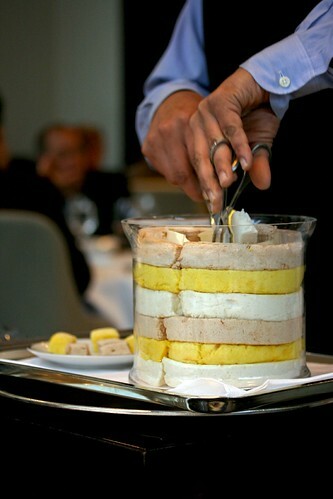 My one observation about the desserts there is that they dont taste as good as they look. The flavor combination and presentation is intriguing but the taste is disappointing. Except for the signature molten chocolate cake, which was divine. I think we had the citrus and chocolate dessert. Danny: It was an exquisite meal! I can’t believe chefs actually read my blog! Wendy: Well, my emotions were swinging from confusion to happiness. Any foie gras of sort is a decadent dish that’s why it’s generally a small portion in comparison to what I had at WD-50 last time. In terms with desserts, what I had when I ate there last time with a friend of mine, the desserts were pretty darn amazing. I guess it’s a hit-or-miss in terms with the seasons or something. I had the tuna sashimi dish as well when I went to JG and, tww years later, it remains one of the TOP food memories of all time. If I think hard enough I can still taste it….mmmmm.